For other uses, see Fairview, Alberta (disambiguation). 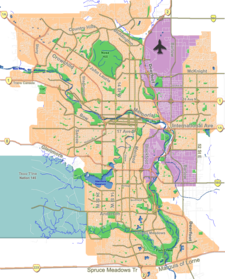 Fairview is a residential neighbourhood in the south-east quadrant of Calgary, Alberta. It is bounded to the north by Glenmore Trail and 66 Avenue S, to the east by Blackfoot Trail, to the south by Heritage Drive and to the west by Macleod Trail. Fairmont Drive bisects the neighbourhood from north to south and Chinook Centre is located north-west from the community. Fairview features homes built in the late 1950s and early 1960s on what are now considered large lots. Many are in the 1,000 sq ft range with most being bungalows. Many homes are still owned and occupied by the original owners. Fairview was annexed by Calgary in 1956. It is represented in the Calgary City Council by the Ward 9 councillor. In the City of Calgary's 2012 municipal census, Fairview had a population of 3,623 living in 1,606 dwellings, a 2% increase from its 2011 population of 3,552. With a land area of 1.3 km2 (0.50 sq mi), it had a population density of 2,786.92,790/km2 (7,218.17,220/sq mi) in 2012. Residents in this community had a median household income of $54,116 in 2000, and there were 17.1% low income residents living in the neighbourhood. As of 2000, 17.7% of the residents were immigrants. A proportion of 18.9% of the buildings were condominiums or apartments, and 27.9% of the housing was used for renting. The community is served by Fairview Bilingual Elementary & Junior High public school as well as by the West Island College (private). Fairview is served Calgary Transit Bus Route 10. The Heritage CTrain Station serves Fairview. ^ a b City of Calgary (2006). "Fairview Community Statistics" (PDF). Archived from the original (PDF) on 2008-04-11. Retrieved 2007-05-17. ^ City of Calgary (2004). "Ward 9 Profile" (PDF). Archived from the original (PDF) on 2007-08-09. Retrieved 2007-05-17. This Calgary-related article is a stub. You can help Wikipedia by expanding it. This page was last edited on 6 October 2017, at 16:58 (UTC).